Receptionists are available between the hours of 8am to 6.30pm. ** Evening surgeries are available until 20:00 with doctors, nurse practitioners and members of our nurse team by prior appointment only. Please ring and ask for an 'extended hours' appointment if you find it difficult to attend appointments during the normal working day. NB: Above opening times excludes Bank Holidays - please read on for how to contact medical services when the surgery is closed. A receptionist is available between the hours of 8am to 6.30pm. Please be aware from 1.00-2.00pm and 6.00pm-6.30pm the surgery doors will be shut but a receptionist will answer the phone to urgent medical calls. Our routine surgery opening hours are between 8.00am and 6pm Monday to Friday except on bank holidays. Our phone lines will always play an informative message telling patients where to get help when we are closed so patients can always ring any of our surgery numbers shown at the head of this page at any time and they will either find us open, or can listen to the message which will advise how to obtain urgent medical care, which is also detailed below. The NHS 111 service looks after the urgent care of our patients for the majority of the time at evenings, overnight, weekends and on bank holidays. So, if you need us before 8.00am or after 6.30pm on a weekday, or at anytime at the weekend or a bank holiday, call the NHS111 service by dialling 111 on your phone. For urgent medical help on a normal working day between 1pm and 2pm or between 6pm and 6.30pm, telephone any of our surgery numbers and you will be directed to our urgent service. 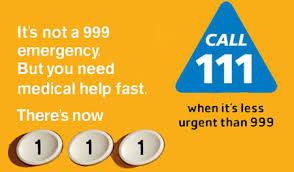 NHS 111 is there for when patients need medical help fast but it's not a 999 emergency. Calls to the service are free from landlines and most mobiles, but pay as you go mobiles need to have at least 1pence in credit to call. For less urgent health needs, contact us or your local pharmacist in the usual way. For immediate, life-threatening emergencies continue to call 999. Chest pains and / or shortness of breath constitute an emergency.